Something besides you loves to eat your food and drink your drinks: bacteria and viruses. 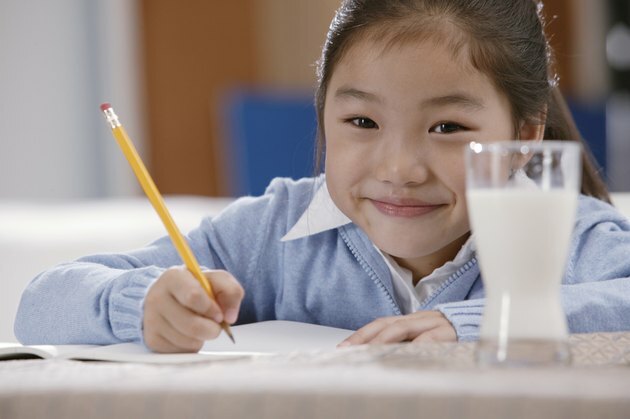 When it comes to milk, leaving milk outside the refrigerator all day can contribute to food poisoning if your child drinks it. Understanding proper storage and handling of milk can help to keep food poisoning at bay and your child well. Bacteria such as salmonella, listeria and E. coli commonly live on foods and can cause food poisoning in people of all ages. Some populations are more vulnerable than others, including the elderly, pregnant women and children, because their immune systems are not as potent as that of a typical adult. Certain environmental factors also make milk more prone to having bacteria develop, including being left at room temperature because warm temperatures foster bacterial multiplication. The longer milk is left out, the longer bacteria have to multiply and grow, which can lead to food poisoning if your child consumes the milk. Identifying bacteria in food can be difficult because bacteria do not always produce a smell or discoloration that can alert you to the fact that a food is contaminated. However, milk often develops a sour smell when it has been left out too long. Milk can also curdle, or develop small, rounded masses produced due to the presence of bacteria and/or yeast in the milk. Always have your child check with you before consuming a snack or beverage to make sure that you can evaluate it for potential food spoilage symptoms. Because milk left out all day can contribute to food poisoning, it's important to practice proper food handling. This includes keeping milk in the refrigerator when not in use. While refrigeration won't keep bacteria from growing entirely, it will slow its growth. When milk reaches its expiration date, this signals a time when the bacteria could reach a too-high point. As a general rule, you do not want to give your child milk that has been left out for more than one hour, according to the Baby Center website. Milk left out longer than one hour could cause food poisoning, even if it does not smell or have curds in it. If your child does consume milk that was left out all day, it's important to observe him for symptoms of food poisoning. This includes upset stomach, stomach cramping, diarrhea and fever, according to the Kids Health website. In most instances, the food poisoning will resolve itself as your child experiences vomiting or diarrhea in an attempt to rid her body of the bacteria. However, you should seek immediate medical attention if you see blood in your child's stool or notice symptoms of dehydration, such as sunken eyes and a dry mouth. Baby Center: How Long Can I Keep Formula Milk Out of the Fridge?